I decided to create a little mini journal using the Eileen Hull minibook die. I used it for both my cover and the inside pages, but will just show you the cover for today. I started by covering a piece of mat board (or mount board as we call it in the UK) with my chosen paper and cut it with the die. I covered the entire piece with clear gesso and when that was dry took a deep breath and started to spray on colour with a mix of Rusty Hinge Distress Spray and a copper coloured Lindy's Stampgang Spray. When still wet I sprinkled on some Infusions in the colour Sunburst. This was hard, as orange is not normally a colour I go to, so I knew at this point already, some rusty stuff would have to come into play too. 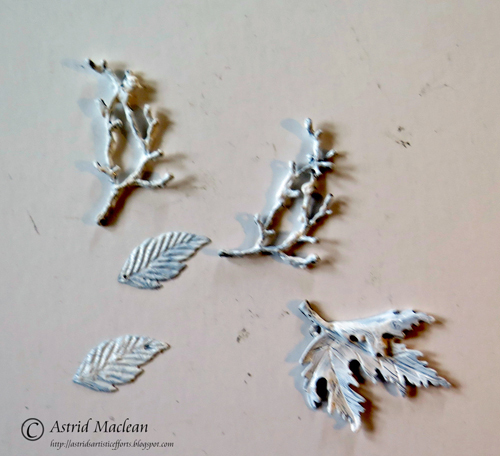 I chose some metal embellishments and covered them in white gesso. 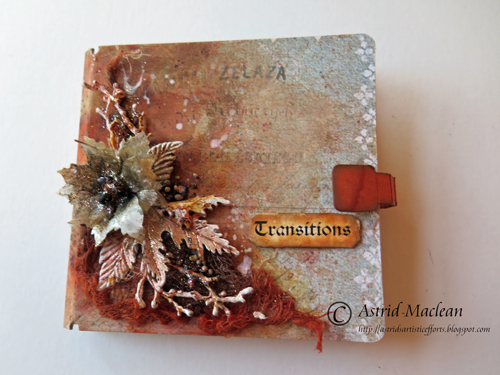 I rather liked the frosty white colour on my branches and leaves, so it was at this point I decided to call my journal "Transitions", as I wanted to depict the transition from autumn into winter, a theme that easily can be carried through for the inside pages too. Still, it needed something to tone it all down a bit, so this flower came to the rescue. 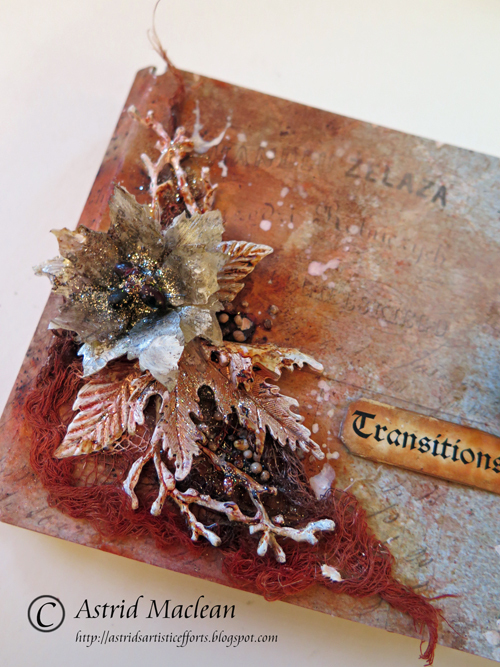 I made it using Clearly for Art and the Tim Holtz Poinsettia die. 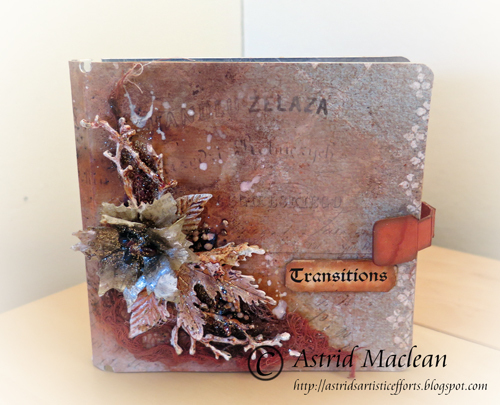 I glued some tissue wrap to one side of the Clearly for Art, die cut it and then added some colour using some Alcohol Inks in a mix of Espresso and Gold Mixative. When heated the Clearly for Art becomes pliable, so it was easy to shape the flower. 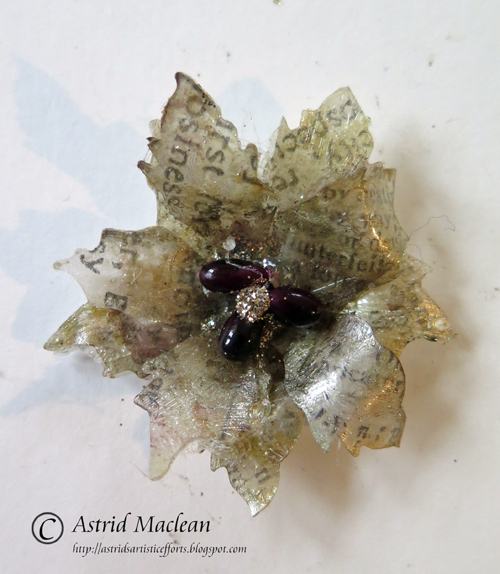 I added some very dark red berries from my stash, using hot glue, and while the glue was still liquid very quickly sprinkled on some Antique Platinum glitter. To add a bit more texture to it all, I dyed some cheese cloth, again using my Distress Sprays, I also added some Prima Art Stones, and darkened everything with a little carefully sprayed Ground Espresso spray. The word Transitions was computer generated. A few splatters with watered down white paint finished it all off. 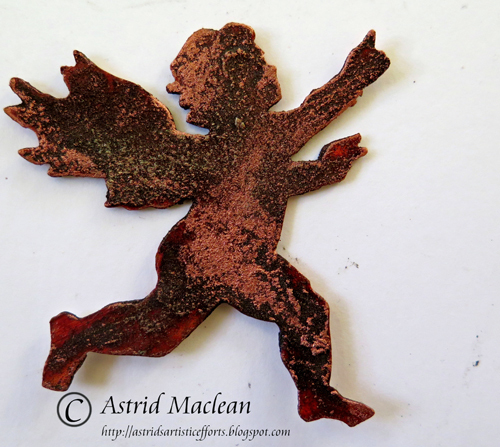 Now I did want to add a bit of something rusty as well still, so decided to alter this little die cut angel for the back cover. The angel was cut from mat board again. I coloured it with Rusty Hinge spray and then rusted it with good old Crafty Notions rusting powder. 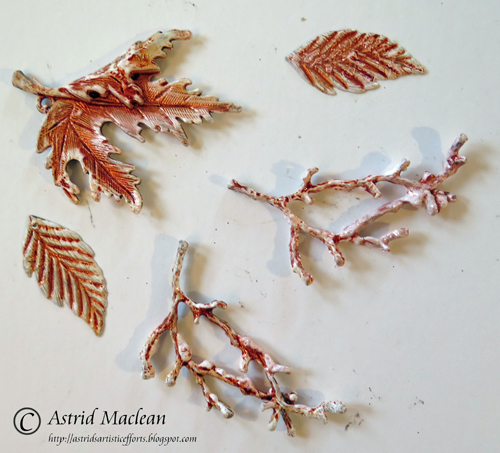 When the rust had formed I highlighted some bits with Copper Treasure Gold. 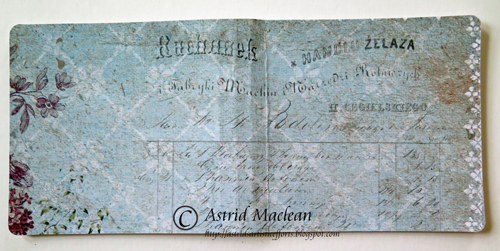 Here you can see it on the back cover. The album closes with the little tab that comes with the die. I glued it to the back and for the front used some velcro dots. You'll be able to see further pages on my own blog in the weeks to come. Well, there you have it, 4 very different projects, all using the same basic ingredients.... Here's hoping we have given you some inspiration this month, and don't forget to come back on Friday for the beginning of our new challenge. wow, Astrid, your cover is fabulous! the other guides' projects are great also. Oh my goodness!!! 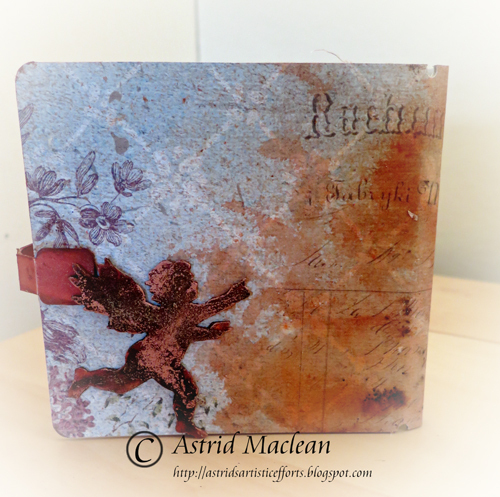 You´ve just done it again Astrid and made the most wonderful cover for your new journal. I absolutely LOVE it. You just always manage to get the best out of every little detail, so it all looks like a million. It´s soooo gorgeous and everything just fit sooo perfect in any way. Stunning work as usual sweet lady, well done. The other girls has also done a wonderful job on their projects, that´s for sure, and it all looks really great. Stunning. Lovely branches, leaves and that gorgeous poinsettia! Beautiful cover! Love the poinsettia! That's gorgeous, Astrid - wonderful wintry gatherings for the floral embellishment, and the colours are stunning on your altered papers - fabulous finish to the month. Perfection in every way Astrid ! You never cease to amaze me with your wonderful projects! Oh this is awesome Astrid! That cover is to die for and all of the extra touches and techniques are amazing! So gorgeous Astrid and you are always so generous in sharing your lovely techniques! Just Beautiful! Thank you for the tutorial. I love the colors you used in this project. This is one fine journal cover! I love what you've done with the colors, Astrid, and those metal trinkets look amazing with the treatment you gave them. The poinsettia has stolen the show--STUNNING! I am so inspired! Always such a pleasure to see how each of the talented Team uses the specified ingredients. Looks like I have some catching up to do! An absolutely stunning cover, love the poinsettia sitting on the frosty leaves, all arranged beautifully. Thanks for the process pictures. Look forward to seeing more of the inside pages. 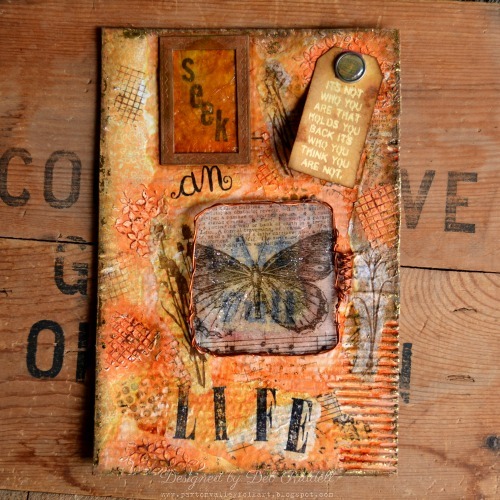 Astrid, lovely work becoming so festive with that orange/rust!! I love your journal! 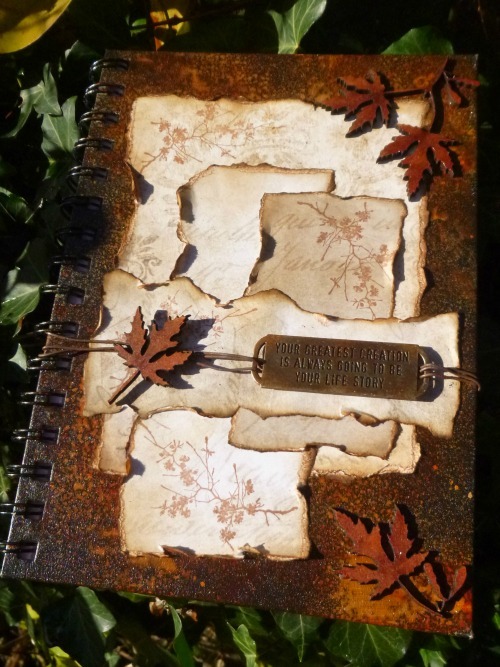 Absolutely gorgeous Journal cover ! Astrid. It is a real 'stand out' work of art so well designed and executed. 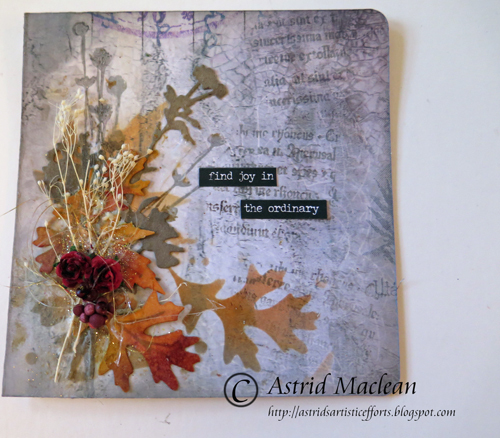 Such inspirational use of the contents of the travel back ..
November Challenge - Cracking Up!